Kent Beard Brush Beechwood Boar Bristle - BRD2 Handmade in the United Kingdom, this wooden beard brush has specially cut and shaped boar bristles to improve brushing performance so it can handle the coarsest of facial foliage, whilst still being gentle on your skin. Each brush comes with a beautiful hand-stitched cotton bag printed on both sides. One side features our company logo from the 1700's whilst the reverse side is emblazoned with our exquisite beard logo designed by artist Andre Visage. Not only a handy bag to store your brush in but for those who use beard oil it will protect your clothes from any excess oil held in the brush head from leaching into unwanted places e.g your suit pocket or the lining of your favourite man bag. This brush is suitable for left handed and right handed gents. 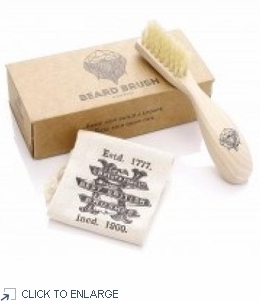 Our wooden beard brush is handmade in the United Kingdom. Some men guild a legacy. Real men grow one. Handmade in the United Kingdom, this wooden beard brush has specially cut and shaped boar bristles to improve brushing performance so it can handle the coarsest of facial foliage, whilst still being gentle on your skin. Each brush comes with a beautiful hand-stitched cotton bag printed on both sides. One side features our company logo from the 1700's whilst the reverse side is emblazoned with our exquisite beard logo designed by artist Andre Visage. Not only a handy bag to store your brush in but for those who use beard oil it will protect your clothes from any excess oil held in the brush head from leaching into unwanted places e.g your suit pocket or the lining of your favourite man bag. This brush is suitable for left handed and right handed gents. Our wooden beard brush is handmade in the United Kingdom. Some men guild a legacy. Real men grow one.